Hi and welcome to my first ever gift guide! I wish I could give the gift of the joy of watercolor to everyone — but this is the next best thing. 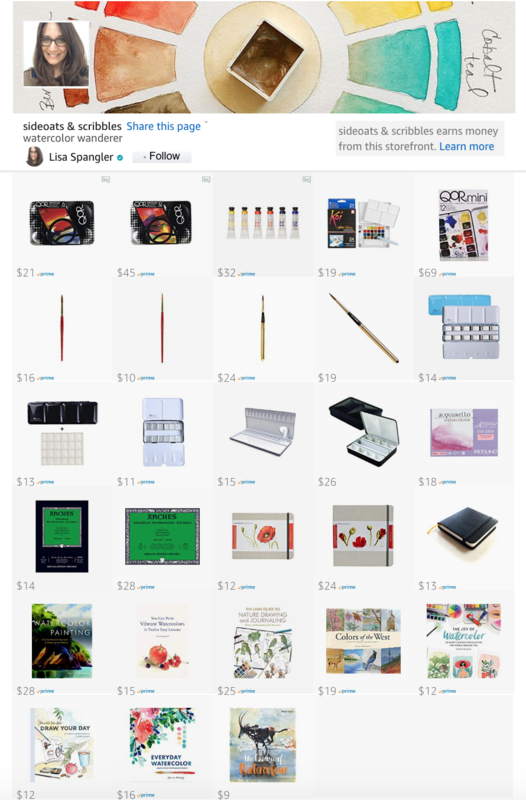 Here you’ll find my favorite paints, brushes, sketchbook and more! Have you heard of Case For Making? They’re an awesome art supply shop in San Francisco and they also make + sell handmade watercolors. Note that I’m not affiliated with Case For Making in any way — I just love their watercolors — they work like a dream and they have colors I haven’t seen anywhere else. Plus the folks who own the shop and work there are so generous and kind and I love supporting them. Watercolors – I can’t say enough good things about their handmade watercolors. If you haven’t tried them before then I’d recommend starting with ultramarine blue or indigo — they’re two of my all time fave blues. Can’t go wrong with either one. On the red side, pink pipestone and French vermillion are my top two choices, and then on the yellow end of the spectrum it’s yellow ochre, hands-down. And then there are the fluorescent colors — ah so good. (Check out this post for more on the neons.) 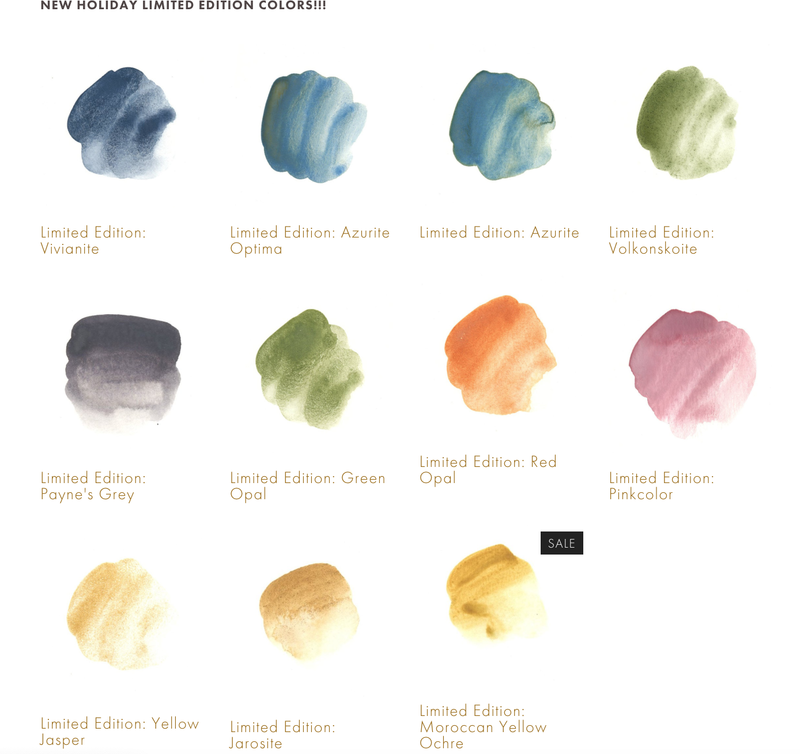 Or go for one of the new Holiday Limited Edition colors shown above! I have the Payne’s Gray and pinkcolor and both are so good. The red opal looks amazing! Paper goods – CFM has so many cool paper products. There’s this set of tiny paper (what is it about tiny things that make them irresistible? ), postcards, and letterpress grid cards. All of these papers are smooth and take pen/pencil as well as watercolors. Metal palette cup – I love this thing! It has a metal clip which you can use to easily clip it to a sketchbook when you’re out in the wild. Best of all, it has a rubber gasket so it doesn’t leak! I keep one filled with water in my pack at all times. Gift certificate – I got a gift card for Christmas and finally scored a ceramic palette last year — I have serious love for it. If you want one and it’s not sold out snag one as fast as you can! The pocket palette from Expeditionary Arts is my go-to palette. I have one with me pretty much at all times. Sometimes I even use it while at my desk! It’s that good. Read more about it here. 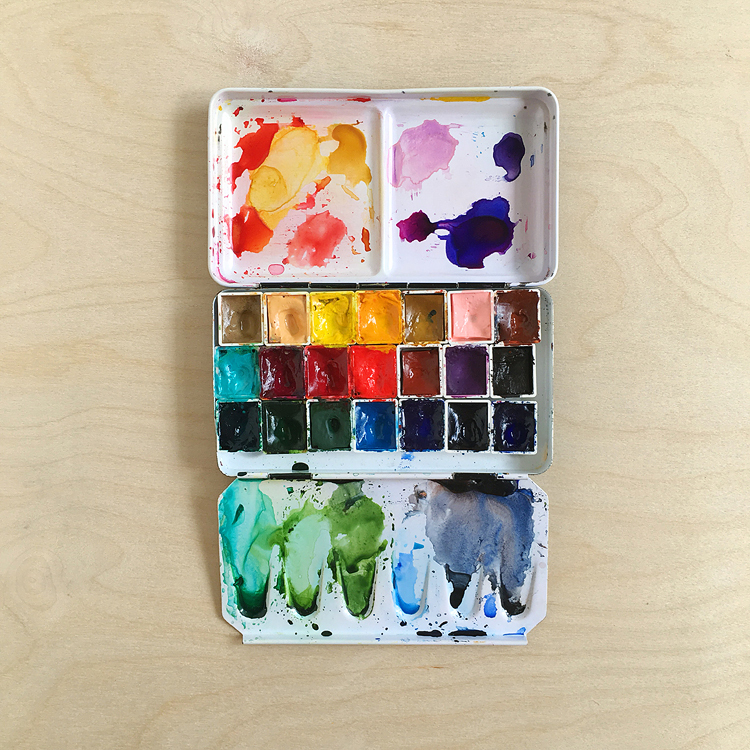 The Essential Colors edition of the Pocket Palette // photo from Expeditionary Arts! Maria has a new version out now that comes pre-filled with the Daniel Smith Essentials set — find my review of that here. 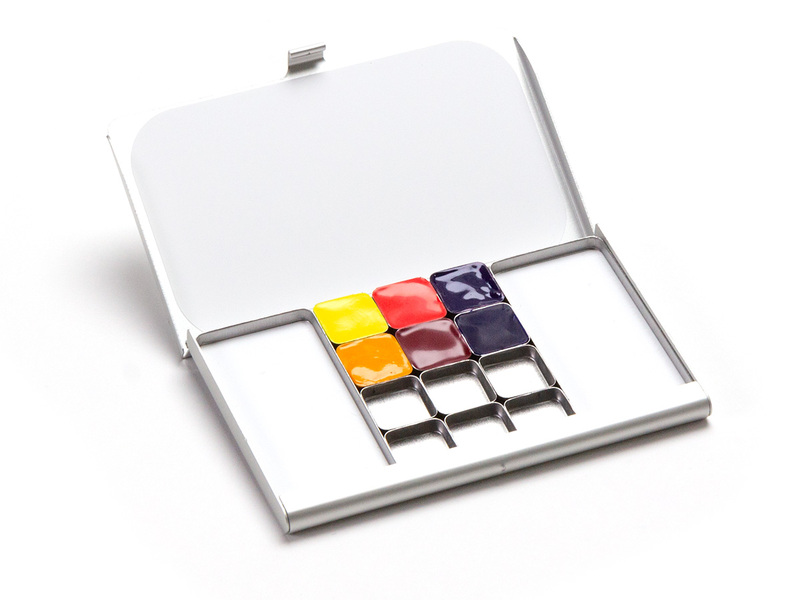 This would be a great gift for anyone who wants to get started with watercolor. Can’t recommend these palettes enough! Note that I’m not affiliated with them in any way, just a happy customer. PS. Just saw where you can get free shipping for U.S. orders through December 18th. First off, I want you all to know that I support independent, local shops as much as I can — but sometimes you just can’t find things locally. Also, Amazon makes it super easy for non-artistic types to shop. Plus if you’re a prime member you just can’t beat that speedy shipping for last minute gifts, right? Note that these are my referral links so I’ll receive a small commission at no extra charge to you if you make a purchase by following the link — thank you! These are all products that I own and use all the time. I purchased all of them except for the Daniel Smith Essentials set — my sister gave me that set 2 Christmases ago and I’ve learned so much from it! I’ve broken down the list into categories to make it easier for you to shop, so here we go! QoR introductory set of 6. The tubes come packged in a metal tin that doubles as a palette and mixing tray! QoR sets – the QoR intro set of 6 colors is hard to beat — read my full review here. The 6 tube colors come in a metal tin that can double as a palette — the lid even has mixing wells! The introductory set of 12 has those 6 colors plus 6 more, including magenta — I consider this my primary red and have a version of this color on all of my palettes. The QoR mini is also a great starter palette at a good price. Daniel Smith Essentials set – read my full review here. This was my first set of “real” watercolors and I’ve learned so much from it! One note about paints — you can mix and match brands together, no problem! My main palette on April 27, 2018. Find out more about my main palette in the Gear menu up top. This is the largest size that I regularly use, as I find having too many colors slows me down — I can only keep so many color properties in mind at a time! Meeden empty paint box with 12 transparent half pans – this one is similar to my main palette above. I like to have extra empty pans on hand so I’d go ahead and pick up some extras with this purchase. That way you can change your mind about what colors are in your paint box. Tip: I write the names on the side of the pans with a sharpie. Also, you can remove the tray that comes with the palette and fit more pans in by adhering them with magnetic tape, rubber cement or blu-tack. I’ve found that rubber cement works the best — it’s the easiest and works best for keeping the pans in place. 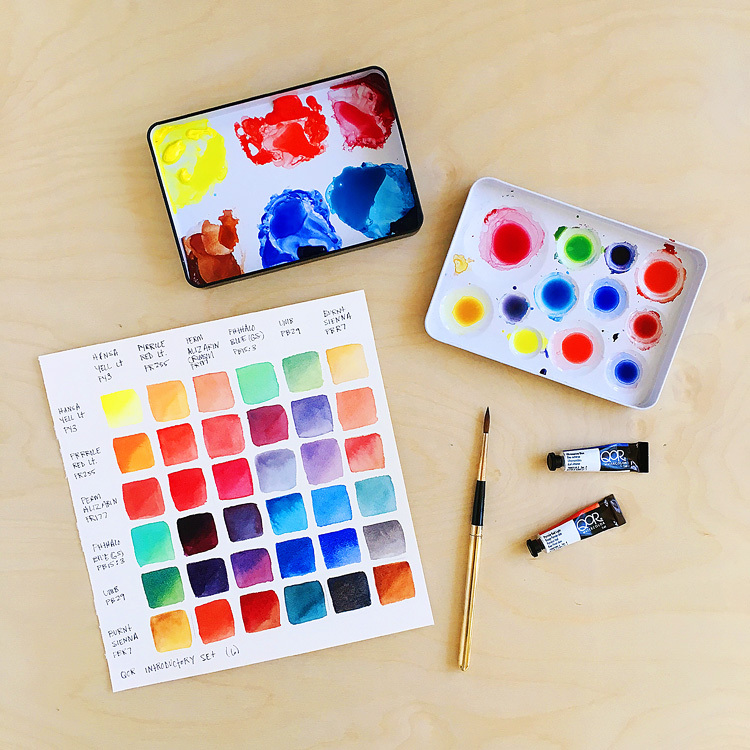 Color Around Aluminum Watercolor Palette – I use this with the QoR introductory set of 12 — lots of mixing room and no pans to fuss over! There are some plastic palettes out there but they always stain, don’t hold up as well to heavy use, and I don’t like how my brush feels on them. 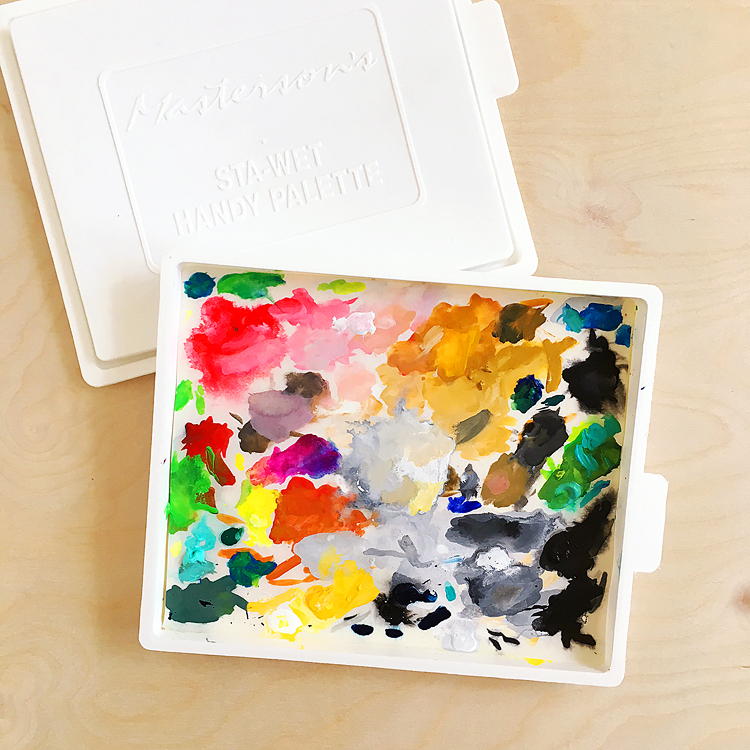 Whiskey Painters 8 half pan paint box – I love the deeper mixing areas on this little guy — great for mixing up enough color for a sky! Read my brush article here — it covers these and more! You don’t need a ton of brushes to get started with watercolor, but having the right brush really makes a difference. The brushes that I use the most often out in the field are travel/pocket brushes with caps, size 6. I prefer this size 6 Isabey pocket brush as the cap is thinner and takes up less room in my pack, but the Escoda size 6 is equally good! 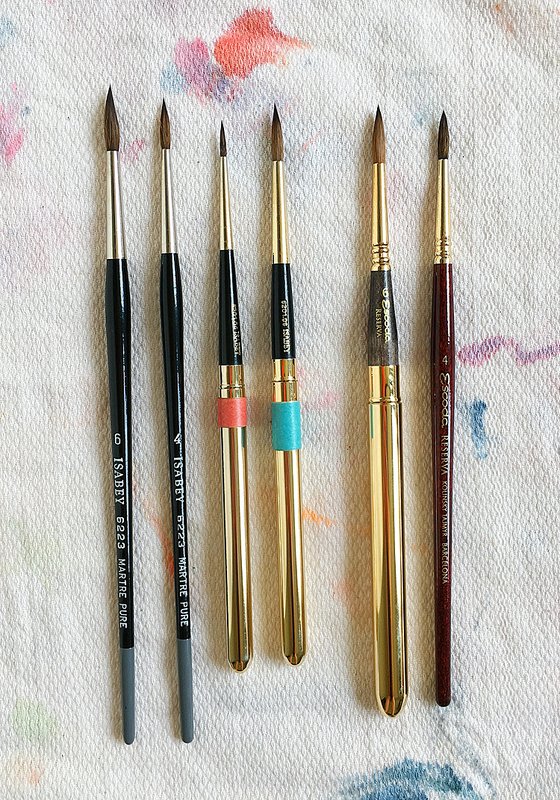 In the photo above, the Isabey size 6 pocket brush is the 4th from right and the Escoda is next to it. Winsor & Neptune Sceptre Gold II in size 6 or size 8 I also use a size 2 for detail work. These are great brushes! They’re a mix of sable and synthetic. Sketchbooks – I use the landscape version of the Global Arts Materials sketchbook most often and the square version for special projects. Find a full review here. I also like this cute little Field Artist sketchbook for fun doodles or color swatches. Arches paper is one of the industry standards for a reason — it’s just great paper! You can get it in a block with all the sides glued down so that you can work on large juicy washes without having to stretch the paper first, or you can save money and get the pad. Watercolor Painting by Tom Hoffmann – I have the kindle version of this book and it’s just as nice to look at as the hardback; it’s more about what makes a watercolor painting sing than a how-to book, but I learned so much from it! I learn more with each reading. 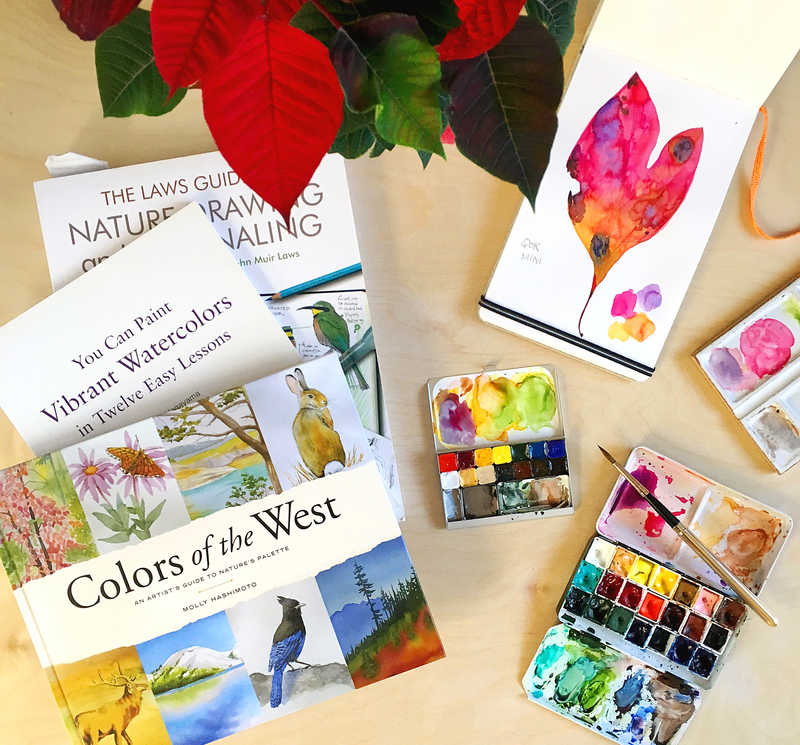 You Can Paint Vibrant Watercolors in Twelve Easy Lessons by Yuko Nagayama – this is a step-by-step book that’s really clearly written with great examples that are totally doable! Laws Guide to Nature Journaling by John Muir Laws – this is a watercolor bible for nature people. It covers so many topics. Find my full review here. John Muir Laws also has a great website with loads of videos — I hope to attend one of his workshops someday. Colors of the West by Molly Hashimoto – this is a great book if you’re planning to visit the Pacific Northwest, Yellowstone, Yosemite, New Mexico or anywhere in between. Molly has organized the book by color and has techniques, color palettes, and bits of history scattered among her sketches. It almost feels like you’re out there sketching with her. The Joy of Watercolor by Emma Block — this book has lots of step-by-step examples that make you want to fix a cup of tea and paint along with her! I can’t wait to try the meadow scene. Draw Your Day by Samatha Dion Baker – this book will truly inspire you to draw everyday! There’s no better way to get better at watercolors than to practice practice practice (and then practice some more). The Essence of Watercolor by Hazel Soan – another book that I learned a ton from! Hazel paints lions and elephants and more — oh my! — and shares techniques and tips throughout the book.